Tai Chi Chuan styles are many and varied, as are the tai chi forms, still they all follow the basic principles of the tai chi movements. But if you are worried about whether or not you are learning the right styles of tai chi then maybe this quote may help. "Imagine different tai chi chuan styles and the tai chi forms as different paintings which depict the same scenery. Some artists consider the sky important, whilst others focus on the river, meadows or trees. After all, they are all painting the same scenery. By understanding this, we find there is no reason for argument over trivial issues, such as how many centimeters away the tree should be painted from the river. Instead, we capture the fact that there is a tree near the river." The various Styles of tai chi, despite having different characteristics, have the same basic principle. That is execution of relaxed actions to create a state of softness, which then accumulated produce a state of firmness, which in turn compliment each other and you have the end result of the balance between the softness and the firmness or the ultimate state of being. The Tai chi chuan styles all have this concept in common. Although there are a lot of tai chi chuan styles out there, truth be told they are the result of repeated revisions by or predecessors after hard practice and serious study. So that they may suit and benefit the needs of different people, as long as the principle of advancing step by step is adhered to. It is one of the outstanding features of tai chi chuan styles, their adaptability. So whether you are learning : tai chi Yang style, Chen style tai chi chuan, Wu style tai chi, Sun style tai chi, Hong style tai chi, taoist tai chi, tai chi qigong. It doesn't matter. What is important and does matter is that the tai chi style you are learning, or want to learn is the right one for you. Our tai chi how to page could also be of help if you are thinking of learning tai chi as it is a good page to read before you start on this journey. I have put together a list of the main tai chi chuan styles below with a brief description on each of the styles of tai chi. Chen style tai chi chuan was the product of the genius martial arts mind of Chen Wangting, of Wen while in Henan province China and is the first of the tai chi styles as so can be called the mother of all tai chi chuan. Adapted from Chinese shadow boxing by Chen, as the Ming Dynasty was about to become the Qing Dynasty, in 17th century China. 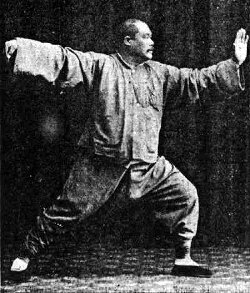 Combining the martial art techniques of the concentrated exertion of inner force (daoyin) as it was known then and deep breathing or (Tuna) which is known now as Qigong. Chen style tai chi is characterised having both hard and soft, fast and slow tai chi movements. It evolves spiraling or coiling energy and Chen style tai chi chuan uses them to its full advantage. Yang style tai chi chuan was adapted from the Chen style tai chi by Yang Luchan (1799-1872) who studied Chen style tai chi chuan from Chen Changxing. Yang's version was adapted again by his third son, Yang Chenfu (1883-1936). It became the famous Yang style tai chi or Yang big style tai chi, that is now the most popular style of tai chi in the world. Known for it's slow consistent movements, it's main focus today is on the health benefits of tai chi and can be seen practiced throughout the parks of china daily. Wu style tai chi chuan Yang Luchan and his second son Yang Banhou (1837-1892) taught a set of the small style of Yang Luchan's style to Quan Yo of Manchu nationality, and his son Wu Jianquan later taught the small style to others. So that it was then called tai chi chuan of the Wu school. This style of tai chi is second only in popularity to the Yang style of tai chi in China today. Its tai chi movements are compact, agile, smooth, even in speed and devoid of leaps and jumps. Please note there are two Wu styles as Wu is two different words in Chinese. Wu style tai chi chuan (Hao)Wu Yuxiang (1812-1880) created this style. He learnt the old form of Chen style tai chi from Yang Luchan and the new style of Chen family tai chi from Chen Qingping in 1852. It was past down from Wu Yuxiang through to Li Yiyu and Hao Weizheng. Wu style tai chi is compact, with emphasis on bodywork and the excretion of inner power. Sun style tai chi chuan Sun Lutang (1861-1880) and created Sun style tai chi as a result of learning Wu style from Li Yiyu and Hao Weizheng ( some call him Hao He). Sun was proficient in Xingyi (internal martial art based on energy flowing in straight lines), and Bagua (internal martial art based on the eight tri grams and 64 directions of the i-ching). Sun created his new style based on combining the strong point of all three of the arts he had learnt. The Sun style tai chi movements are similar to the Yang school's in postures, and to the school of xingyi in theory.